This is very good news. It means that teeth that are simply damaged can be induced to regrow outright. The protocol is not well defined yet, but the principle is clear enough. The tooth is cleaned up and stimulated. It is then likely temporarily protected as well and allowed to grow in with some additional stimulation likely required. Thus the next several years will see both this therapy and the actual implanting of fresh buds to produce new teeth where lost. This means that a full recovery of a mouth of teeth is becoming practical and way more important, worth planning for. Hang on to what you have, baby them if necessary and full recovery will be that much easier. The impossible just keeps coming on the dental front. Few things in life are less pleasant than going to the dentist to get a filling. With all of that drilling, poking and scraping, it's no wonder people try to avoid going to the dentist at any cost. 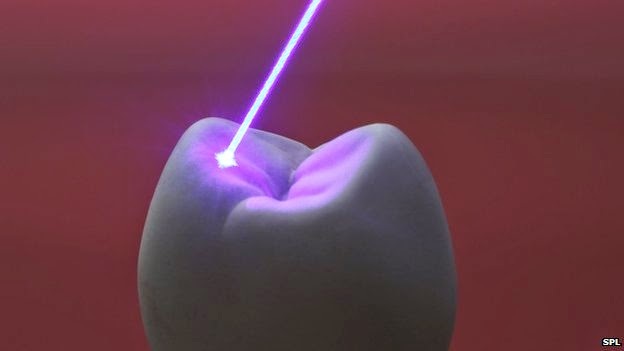 Lasers have been used by dentists for years both for tooth whitening, and in place of a drill for prepping a cavity. That's great, but when it comes to actually filling the hole, we're still stuck with the age old trowel and spackle approach. What if your broken teeth could be made to heal by themselves, in much the same way as your skin and bones will grow back after trauma? That's the thinking behind a new type of laser therapy that uses infrared laser light to stimulate natural tooth growth. Researchers at Harvard University's Wyss Institute have been working on methods to stimulate this type of natural tooth repair, and they think they have found a winner using an infrared laser technique called low-level light therapy. They drilled holes in the teeth of rats, and discovered that when they directed an infrared laser at the affected area, it stimulated stem cells to create new dentin, the basic building block material used at the core of teeth. Lead researcher Dr. David Mooney says that this stimulative method holds great promise for reparative therapy beyond teeth, but for now they plan to focus on dental repair. The next step is to start human trials, and to establish a set of safety protocols by working with the National Institutes of Health. Dr. Mooney says that because lasers are already widely accepted in dentistry, he doesn't see any major hurdles in the path of the regenerative therapy. I'll be happy if I just don't have to hear that whining drill anymore. This sounds like a great advancement, but there's a little known secret that, if one eats an alkalizing diet, one's cavities heal themselves without any help from the dentist. I saw this first hand in my children. Both of them had small cavities that our dentist wanted to fill. I stalled and magically, the cavities disappeared. Now if one insists on eating large amounts of sugar, wheat and processed foods, forget it. I have a theory, which is mine, that it is a bad idea to go to a dentist or an md, for they are bound to find something "wrong" that "requires" their intervention. Better to avoid them and let time heal all wounds, as long as you have a healthy lifestyle. If you don't, you're doomed anyway, so why let them mess with you?